The Chinese River Dolphin is a Critically Endangered species according to the IUCN. It may be extinct in the wild. Common name: Baiji, Yangtze River Dolphin, Chinese river dolphin, white-fin dolphin, white-flag dolphin. The total population in the early 1990s was believed to be less than 100 individuals in the wild. The last documented sighting was in 2002. In 2006 an acoustic and visual survey failed to find a single individual in the Yangtze River. 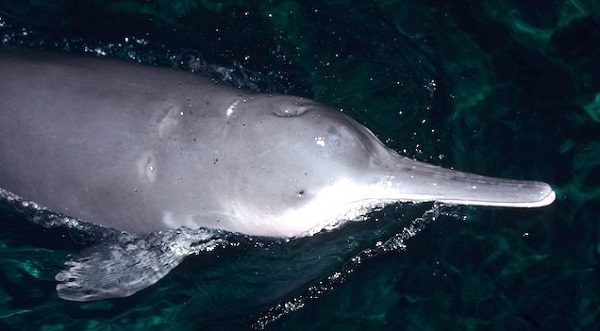 According to the IUCN evidence suggests that the Chinese river dolphin is close to extinction. The baiji may be functionally extinct in the wild. Another cetacean following the steps of the baiji is the vaquita porpoise (Phocoena sinus) that inhabits the Gulf of California and is Critically Endangered with less than 150 individuals surviving in the wild. The Chinese river dolphin population declined drastically as industrialization progressed in China. Rivers were heavily used for transportation and fishing. Development of dams and hydroelectric has transformed their habitat reducing access to fish stocks and other bodies of water. Industrial pollution, expansion of agriculture and deforestation have affected the water quality of the Yangtze River. Since 2008 the IUCN has considered the Chinese river dolphin as Critically Endangered and facing an extremely high risk of extinction in the wild. The government of China has given full legal protection and designated the baiji in the First Category of National Key Protected Wildlife Species. This species is listed in Appendix I of CITES. The Chinese river dolphin is endemic to the Yangtze River in China. It can be found up to 1,180 miles (1,900 km) from the mouth of the river, the middle and lower regions of Quintangjian River and the appended Dongting and Poyang lakes. They are found exclusively in fresh water. They favor the large eddies on the side of rivers that form downstream of an obstruction where water flows in the opposite direction from the rest of the river. 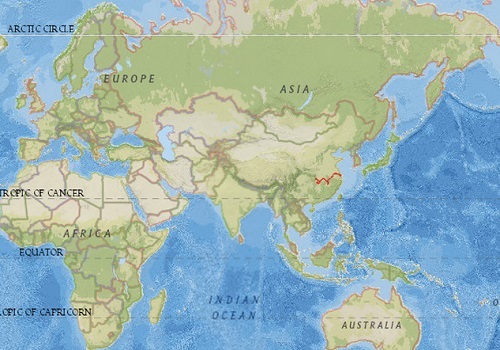 Chinese River Dolphin Distribution Map. Adapted from IUCN Red List of Threatened Species. The Chinese river dolphin, also known as baiji, has pale blue-gray skin on its back and white on its belly. It has a long and upturned beak. Its dorsal fin is light gray and triangular which resembles a flag when swimming, therefore its name “white-flag” dolphin. Females are larger than males. Females range from 6 to 8.3 feet (1.85 to 2.53 meters) in length and weigh from 141 to 368 lb (64 to 167 kg). Males range from 4.6 to 7 feet (1.41 to 2.16 meters) in length and weigh from 93 to 276 lb (42 to 125 kg). Like other species of river dolphins, the baiji has small eyes and poor vision. Just like other dolphin species the Chinese river dolphin relies on echolocation for orientation, hunting and communication. To echolocate dolphins emit clicks under water, the sound waves bounce back and is received and analyzed by an organ called melon located on their foreheads. The melon processes the information regarding distance, shape and size. Most of their time is spent large river eddies. They are usually seen in pairs of mother and calf. Males reach reproductive maturity at 4 and females at 6 years of age. The baiji breeds in the first half of the year. Gestation is 10 to 11 months and birth interval is every 2 years. Females give birth from February to April to one calf that measures about 3 feet (1 meter). The Chinese river dolphin is piscivore, their diet consists mostly on fresh water fish species. Maximum longevity of 24 years in captivity. The Chinese river dolphin does not have any natural predators other than humans. ⇒Natural History Museum – Is the Yangtze River Dolphin Extinct?